If you want to see Life, don’t watch the trailer or read the spoilers. Better yet, don’t read this review, even though I’m not spoiling anything. Life is one of those films you might like if you don’t know anything beforehand. Life is the latest space sci-fi film that premiered last week. I try not to spoil it much, but let me tell you the simple version of the main plot. We live in the near future. Six piece team is on the International Space Station on the orbit of the Earth, investigating the samples they brought from Mars. The sample, the ‘life,’ is not what they thought it would be. The actors Ryan Reynolds and Jake Gyllenhaal are familiar to everyone. Haven’t seen the Russian star Olga Dihovichnaya before, she is surprisingly good. Rebecca Ferguson is a familiar face from some tv series and movies like Mission: Impossible – Rogue Nation and Florence Foster Jenkins. Aside from side roles, haven’t seen the British actor Ariyon Bakare before. Japanese actor Hiroyuki Sanada has made a great career and can be seen in modern movies like The Last Samurai, Rush Hour 3, and 47 Ronin. The acting is good but expected a bit more from Gyllenhaal and Reynolds. They are a bit too safe in their sector. The director Daniel Espinosa however, has directed very few films before. Only two of them have gained a mainstream attention, Safe House from 2012 and Child 44 from 2015. The latter I have not yet seen, but Safe House was so-so and saved by Denzel Washington’s Acting. 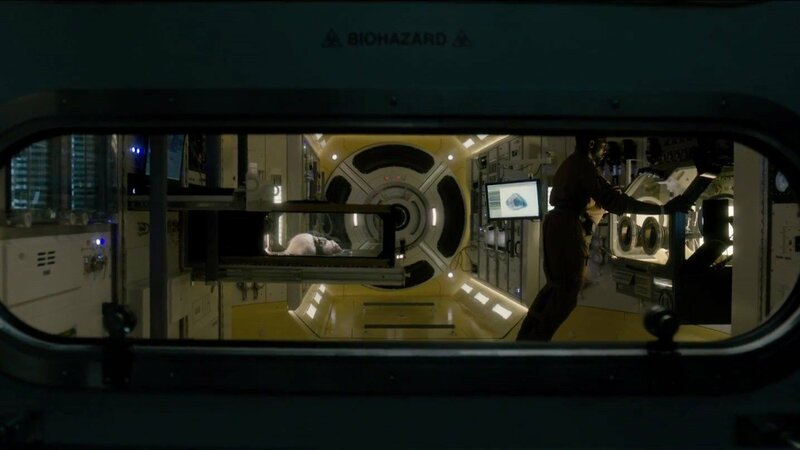 The film starts as any space station movie but soon appears to be more of a horror movie. Some say it borrows a lot from Alien and Gravity and I agree, life lacks originality, you kind of know what to expect after the first half. I love the horror element of the space itself because the vastness is terrifying itself. Only one slip and you’re doomed forever. Life is a very suspenseful movie and in that sense, very effective one too. Last time I was feeling like choking in terror was while watching The Ruins (2008) by Carter Smith. Not so known director Espinosa delivers a thriller that keeps you on the edge of your seat. Some of the criticizing reviews sound like they wanted to watch a documentary. For example, in one report I have seen the viewer is annoyed that NASA didn’t select astronauts diligent enough for this mission. I mean, come on, this is a work of fiction! I agree, there are nerds among space film diggers, but don’t try to reason everything that happens in a fictive movie. I agree, there are logical errors in the film, though. But not that much I’d be annoyed. Life is overall an entertaining and tense sci-fi horror film. Nothing too fancy, but as a space fan, you should watch it. Seven out of ten. I don’t think we are talking about the same movie as the black guy didn’t die first (no spoilers, please). This came out just this week in Finland. Here’s the interview from “the black guy” in Life (2017).